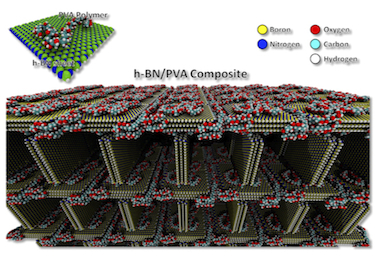 Hexagonal boron nitride (h-BN) is a technologically important 2D material with a naturally occurring layered structure. It has many excellent properties, including high temperature stability, high thermal conductivity and high mechanical strength. A team of researchers in the US, Korea and Brazil has now succeeded in making the first stable, lightweight 3D foam from the material by combining it with polyvinyl alcohol (PVA) in a simple freeze-drying technique. The foam might be used in applications such absorbing carbon dioxide, protecting against laser irradiation or as a filter to separate oil and water…..